Ultra wide band impulse radio (UWB-IR) exploits extreme amplitude modulation (AM) by sending only 2ns wide pulses. 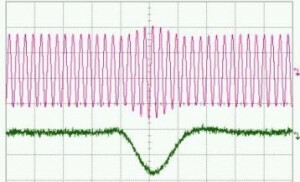 The signaling in UWB-IR typically corresponds to a channel bandwidth of approximately 500MHz or greater. The receiver in UWB-IR implementations usually utilizes non-coherent energy detection, which also reduces complexity and more importantly, power consumption. However, wide channel bandwidth makes the radio susceptible to jamming, as an in-band narrowband interferer can easily corrupt the channel. Although, a notch filter can be used, this approach cuts down the UWB signal strength around the two bands. As a result, the channels around the two bands where the narrowband interferers are expected must be abandoned, cutting down on available spectrum. 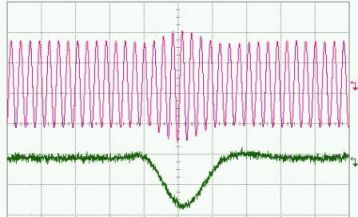 An interesting solution to the problem is using the Teager-Kaiser operator, which down-converts the in-band narrowband signal to close to DC, where subsequent high-pass filter ensures complete removal of the interferer. This effectively achieves a very high quality notch filter without any pre-knowledge of the center frequency of the interferer. The T-K operator exploits the temporal correlation of the signal in narrow-band signaling (slow changing information) to discriminate against fast changing wide-band impulse signaling and can be very effective in removal of narrow-band interferers.